Why volunteering should be a part of a leader’s job? 40 volunteers undergo special training including rescue techniques at Home Front Command base. Can A Great-Grandmother Serve In The IDF? Ezer Mizion Highlighted at the AIPAC Policy Conference in Washington, DC. William Sims knows this first-hand. He's a Vietnam combat veteran and says he had, what would now be classified as, PTSD symptoms when he returned from battle. Sims says his mom pointed him to gardening, which he started doing at the time. He also became an organizer, helping veterans learn about benefits and access resources. Now Sims works for the Center for Veterans Issues. They run Vets Place Central, a rooming house and resource center for formerly homeless veterans on Milwaukee's west side. Today, like every Saturday morning, he's at the Organic Therapy Garden at Vets Place Central. The garden was Sims' idea, and he helped create it over 10 years ago by volunteering his time. It's expanded as well, and now houses 14 garden beds for veterans to fill with plants. The veterans who live at the Center get a small stipend for working here. Other vets, like Sims, volunteer to keep the garden running. Sims says gardening can relieve stress and take away PTSD symptoms. "Well, you’re dealing with the earth, it feels good, and you’re growing something. Generally, veterans, in their capacity, they’re destroying something." 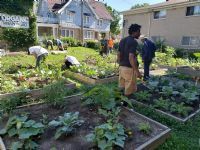 He has also found volunteering to be like gardening: a way to relieve stress, take away PTSD symptoms, and build self-worth. Another veteran who's used volunteering to deal with the trauma of active duty is John Stuhlmacher. He served in the Wisconsin Army National Guard and was deployed a few times, including to Iraq in 2003. "When I was in the military, we had a purpose and drive and kind of a mission greater-than-self mentality. And after getting out of the military, I still had it a little bit," he says. "But as PTSD and other things creep in, you start to slowly close back in on yourself. You don’t really see that purpose anymore, that greater good type thing, at least I didn’t." Stuhlmacher says he found a sense of purpose by volunteering after Hurricanes Irma and Harvey hit last year. He joined a disaster response group made up of military veterans and says while the main goal is helping victims, volunteers get something out of it too. "What a lot of us kind of call it recharging the batteries," Stuhlmacher adds. "When you’re really starting to get down, or something like that, if you go on one of our operations you feel rejuvenated." These stories are not surprising, according to Dr. Monica Matthieu, an associate professor of social work at St. Louis University. She’s found in her research that veterans who volunteer tend to have healthier, more fulfilling lives. Mattieu says their mental health improves when they serve other people. "And when people [volunteer], individuals who’ve experienced trauma in their background find that the symptoms of numbing, and of avoiding, really are decreased because you’re really engaging with others, you’re serving others, and it really allows people that perspective that the world can be safe again." When the volunteering work individuals do is with other vets, there’s an added mental health benefit, she says. "The level of social support and comradery with other veterans has really helped their feelings of loneliness and depression, feeling isolated perhaps in their lives." William Sims, from the veterans garden, agrees that volunteering helps vets know they’re not alone. He offers up some wisdom that can help vets and civilians alike: "If veterans can look outside themselves and understand that they’re not the only ones who are suffering through certain things, then I think it helps them and it also helps the other people that they’re in dialogue with." By next year, Sims will have spent 50 years working with vets at the Center for Veterans' Issues. He says after he retires, he’ll continue volunteering at the garden. There are no responses for that item.